The annual scientific event organized by the Scientific Union of HYGEIA Doctors was successfully held at the Cultural Foundation of Tinos, on the island of Tinos, on May 18-20, 2018. The event organizers were Mr Kosmas Iliadis, Director of Thoracic Surgeon Clinic and Mr Paris Kosmidis, Director of 2nd Internal Medicine – Oncology Clinic of Hygeia Hospital. 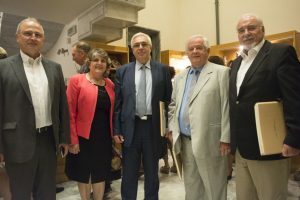 On Saturday May 19, 2018, Mr Andreas Kartapanis, HYGEIA Group CEO; Mr Vasilis Prasopoulos, Chairman of the Scientific Union of HYGEIA Doctors; and Mr Evangelos Gyzis, President of the Cultural Foundation of Tinos, delivered welcoming speeches to the participating doctors and other attendees. The scientific event was held under the aegis of the Municipality of Tinos. This year, the medical lectures focused on the major significance of prevention, with the motto being Prevention Saves Lives. The concept of prevention, and the talks on obesity and cancer attracted major interest. The modern lifestyle is associated with the development of cancer, while the value of breast cancer prevention using the most advanced methods gave rise to fundamental questions on prevention in general for all types of gynecological cancers. The speakers also concentrated on the latest developments in prostate surgery, as well as on the prevention of colon, digestive tract, liver and lung cancer, while they also pointed out once again the harmful effects of smoking. Another topic that attracted major attention was the role of low-dose chest CT scans in lung cancer prevention.